Professor Aven Nelson, 1899. 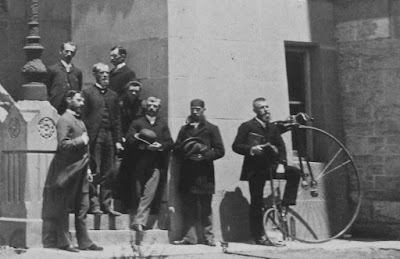 All photos of Nelson and the Yellowstone expedition are from the Aven Nelson Collection, American Heritage Center, University of Wyoming. He was appalled to see so many papers on the ground and demanded that they be picked up at once ... There ensued much talk about rules and regulations, in the course of which he discovered that we carried two rifles. 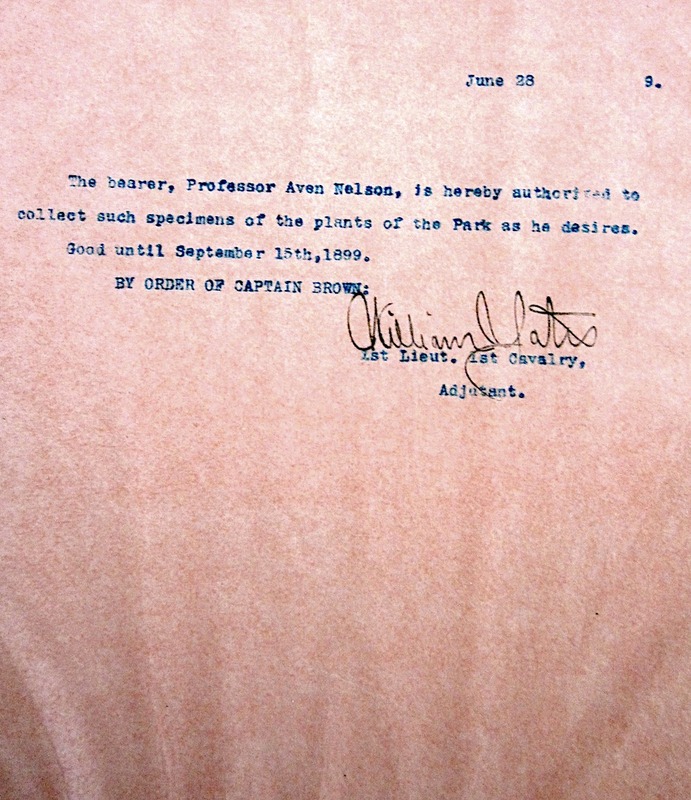 After sealing both, he insisted that the signature of Captain Brown would be prerequisite (excerpts from Mrs. Nelson’s diary are from Williams (1984) who “abbreviated and paraphrased” them). The soldier was shown a letter from the Acting Superintendent of the Park, but was not persuaded. The campers picked up the felt papers they had carefully arranged in the sun, and drove 46 miles to Mammoth (two days travel) where they obtained a permit. Professor Nelson, his family, and two student assistants were in Yellowstone Park ostensibly to document the flora (plant species). But Nelson had grander plans. By the time they left in early September, they had collected, pressed, and dried 30,000 specimens. 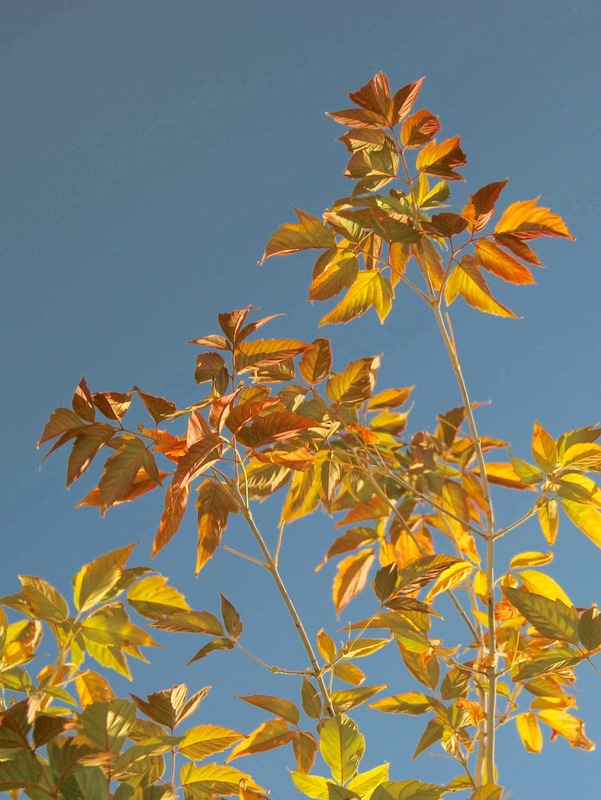 The project would launch the Rocky Mountain Herbarium at the University of Wyoming—Nelson’s greatest legacy. In July of 1887, 28-year-old Aven Nelson came to Laramie, Wyoming Territory, to be Professor of English at the new University of Wyoming. But the Board of Trustees had mistakenly hired two English professors, so Nelson agreed to teach botany and biology. Apparently the six lectures on plants he attended at the Missouri Normal School, and his biology teaching assistantship at Drury College, qualified him for the job (Williams 1984). University of Wyoming faculty in the early days; Professor Nelson on right with bicycle. It was a fortunate change in profession. 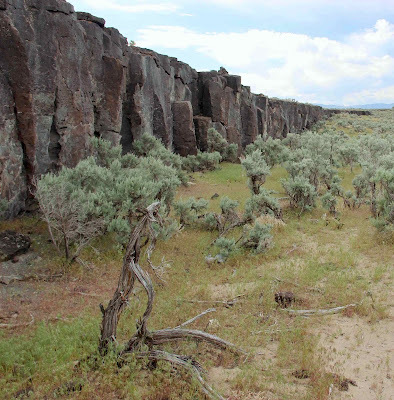 Wyoming’s flora was still poorly known, with abundant opportunities for discovery and academic advancement. Nelson’s career would be long and productive. 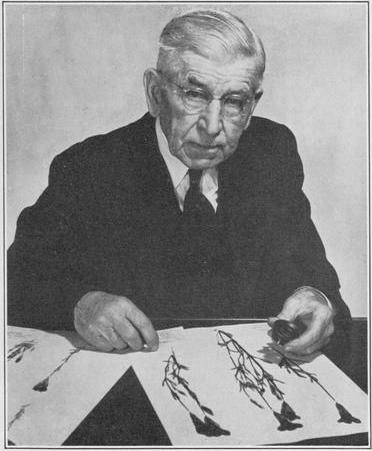 He remained active in botany at the University of Wyoming almost until his death in 1952, at age 93. A botanical expedition of vast importance was planned for the following summer. Some three or four months were to be spent in Yellowstone Park collecting plants ... Many students, juniors and seniors, were anxious to accompany Dr. Nelson on that expedition, and were willing to work for nothing just to see the Park ... this was in the days when autos were much like hen’s teeth and trips through the Park by stage were expensive (Goodding 1958). Nelson hired 19-year-old Goodding as a field assistant and chore boy, at $10 per month and all expenses paid. The other assistant was Elias Nelson, Nelson’s first graduate student and no relation (Williams 1984). 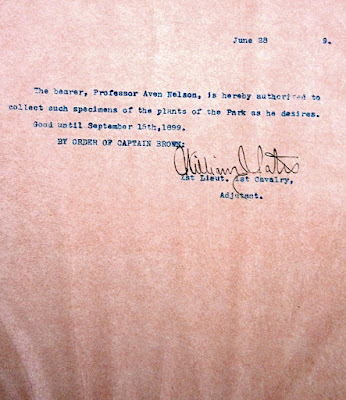 Nelson wrote to the park requesting permission to collect plants “to represent the vegetation of the Park in full ... dried specimens of the smaller plants and such twigs of the larger as may conveniently be preserved on the usual herbarium sheets, 12 x 16 inches.” An affirmative reply came within the month (Army Era records, YNP Archives). The flora of the park is, however well worked up as several collectors have been in there, viz., the Hayden Survey, C.C. Parry, Letteman, Burglehous, &c. The one that has done the most, however, is Frank Tweedy of U.S. Geological Survey. He spent two whole summers in the park. Rydberg drew a map of areas covered by previous botanists, and sent it to Nelson. On June 13, 1899, botany students Leslie Goodding and Elias Nelson arrived by boxcar in Monida, Montana, then the western gateway to the Park. They unloaded a wagon, three horses, provisions and gear, including six plant presses and several thousand “driers and white sheets” (Goodding 1944). Two days later, their mentor, Professor Aven Nelson, his wife Allie (Celia Alice), and their two daughters arrived by passenger train. It was the start of a 14-week botanical adventure in Yellowstone. They left Monida on June 19, traveling east up the valley of the Red Rock River where they did their first collecting. 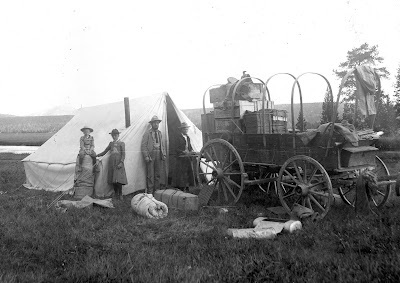 “As we approached the Continental Divide and the Idaho line, we were impeded by mud, and the wagon had to be unloaded to get it free,” noted Mrs. Nelson. The next day they crossed the Continental Divide into Idaho, camped near Henry’s Lake, collected the following morning, and moved on, entering the park on June 23 (descriptions of field work in the Park are from Williams 1984 unless noted otherwise). Nelson’s wagon had a mess box in the back, with a door that could be lowered for a table. They also carried a large table with detachable legs, and a sheet iron stove. When the weather was fine, they dined outside. For the expedition, Nelson purchased a 12 x 14 foot canvas tent with a stout ridge pole and a reinforced hole for the stove chimney. “For twelve consecutive weeks, no one slept under a roof other than the tent, and the two boys usually under the vaulted star-studded skies” (Nelson ca. 1937). They could legally camp wherever they wished, as long as they were at least 100 feet from roads. Park regulations required they leave their campsite “clean, with trash either buried or removed so as not to offend other visitors.” Hanging clothing, hammocks and other articles within 100 feet of a road was banned, as was bathing without suitable clothes (Culpin 2003). “The men fished but caught nothing,” Mrs. Nelson wrote, until “Elias developed the technique of throwing his plant-digging chisel through a big fish as it moved upstream.” On July 2, he caught 23 fish. Most days they broke camp early and traveled park roads, stopping at promising sites. The men went out to collect, each with a vasculum over his shoulder—an oblong metal container (today we use plastic bags). 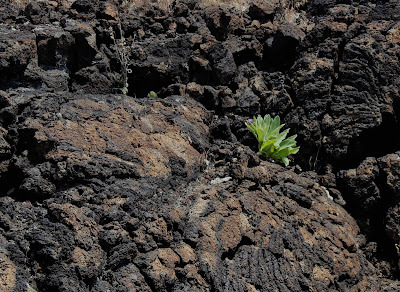 Many plants were collected in their entirety, but for larger species they took parts—a section of stem with leaves, another with flowers, and fruit if available. Botanists in the field; note plant presses in wagon, vasculum on ground. They all wore the popular felt campaign hats—today’s Mounty or Smokey the Bear hats. 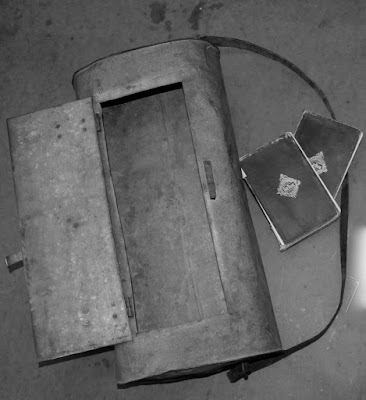 A Nelson vasculum and fieldbooks (Marriott photo). In late afternoon, they would look for a suitable campsite with water, firewood, a flat spot for the tent, and grass for the horses. Plant processing began as soon as the tent was pitched and materials unloaded, often continuing into evening. Plants were pressed and dried, using felt blotters to absorb moisture. Each specimen was carefully arranged between sheets of white paper and added to a growing stack alternating with blotters. Then the stack was tightly bound between wooden covers. The next day, presses were taken apart, damp blotters replaced, and presses reassembled. This continued daily until the specimens were dry. Leslie Goodding sits between stacks of blotters, checking specimens. This photo was taken near the end of the expedition, by which time he had worn the soles off his boots. Nelson brought along several thousand reusable blotters, but maintaining an adequate supply of dry ones was difficult. Ideally damp blotters were spread out to dry in the sun. But when it rained for days at a time, they kept a fire going all day in the tent, with plant presses and blotters carefully arranged around the stove. They mainly collected near roads, even though earlier collectors had done the same (Goodding 1944). Occasionally two men made long excursions on foot while the third stayed with Mrs. Nelson and the girls. Notably, they never reached the unexplored country recommended by Rydberg. Why did Professor Nelson ignore obvious opportunities for discovery? Lack of roads probably was a factor. But there was another consideration: By the time they reached the southern part of the park, they were short one man. 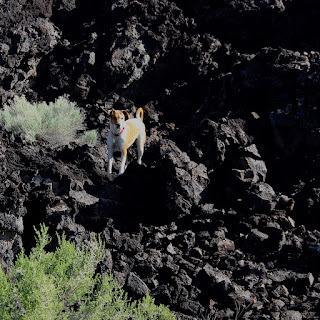 On July 26, Elias and Leslie were collecting near the popular Artist Paint Pots, where visitors were routinely warned to stay on established paths (Guptill 1892-1893). Elias wandered off anyway, sinking a leg in hot mud to the knee. He jumped to high ground and pulled off his shoe and sock, along with a large patch of skin. A huge blister ran up his leg. “With the help of several nearby tourists, I sprinkled the wound with soda, bandaged it, and covered the bandage with flour,” wrote Mrs. Nelson in her diary. 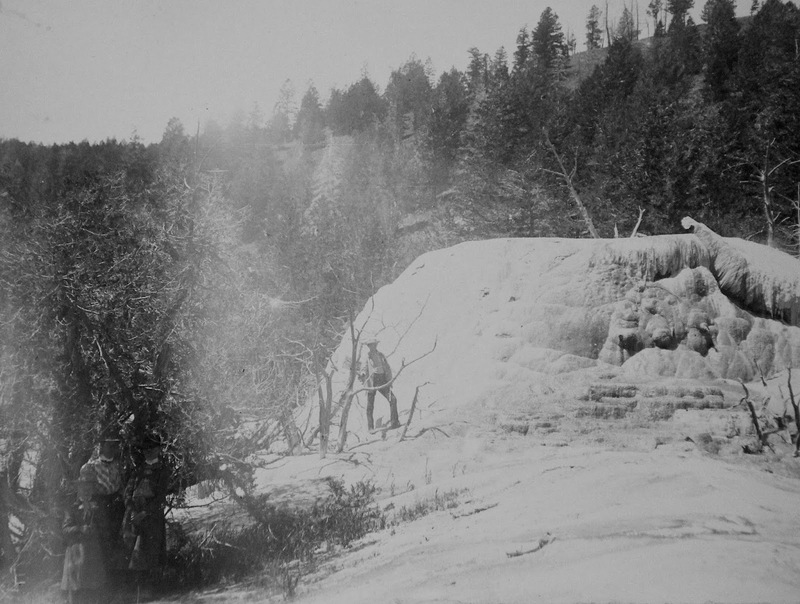 “Elias was in great pain, but never uttered one groan.” At the Upper Geyser Basin, a visiting physician examined the burn and recommended Elias go to the hospital at Fountain or return home. So Professor Nelson drove him to Madison, where Elias took the stage to Monida, understandably disappointed that his great adventure was over. Adventurous botanist mid-photo; Mrs. Nelson and daughters are standing by tree, lower left corner. In early August, impassable muddy roads forced a two-day layover at Yellowstone Lake. 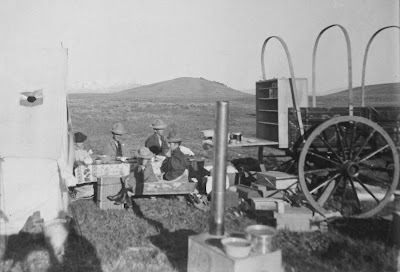 When the weather improved, they drove south to the Teton Range, where Nelson and Goodding collected alpine plants for the first time on the trip. Then it rained for a week. Snow fell on August 19. By the end of August, the Nelsons were ready to go home. They reached Monida on September 3, making scattered collections en route, and two days later were back in Laramie. During their 14 weeks in Yellowstone, the Nelson party collected roughly 30,000 specimens (Williams 1984)—an astounding number given the conditions. Yet only about 500 species were represented (precise number is unknown due to subsequent changes in classification and nomenclature). Most specimens were duplicates—multiple collections of a given species from a given site. Clearly, documenting the flora of the Park was not Nelson’s primary objective. 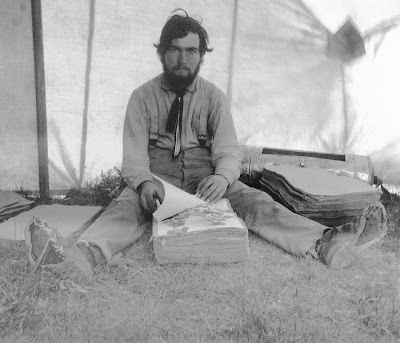 He was intent on expanding the botany program at the University of Wyoming, specifically the herbarium (a collection of plant specimens and associated data). With just 1,500 specimens, the University herbarium offered little prior to the Yellowstone project. That changed dramatically—1,400 specimens were added directly and thousands more through exchange. 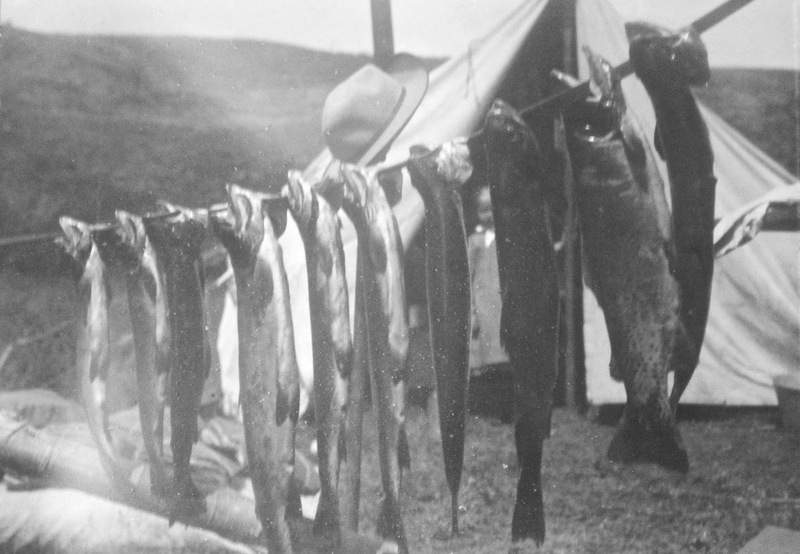 Nelson knew that institutions and collectors would want specimens from Yellowstone, the famous natural wonderland, and he collected accordingly—often 20-30 duplicates per species per site (Nelson ca. 1937). A full set of duplicates went to the US Herbarium at the Smithsonian (the Park had no herbarium at that time). Smaller sets were distributed across the US, in Europe, and as far away as India, in exchange for specimens for Nelson’s herbarium. Sets also were sold to raise money for field work (Williams 1984), a practice no longer permitted by the National Park Service or the University of Wyoming. Shortly after returning from Yellowstone, Nelson convinced the Board of Trustees to designate a separate institution for the University’s plant collection—the Rocky Mountain Herbarium. 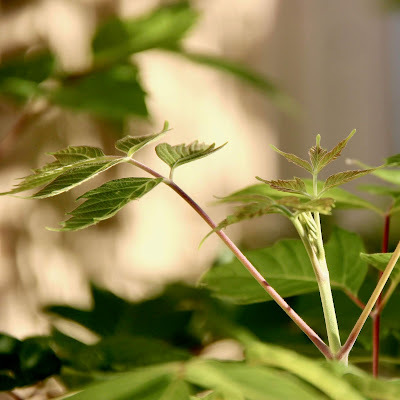 They intended it to be “an accessible and serviceable collection” of the region’s plants, but it has far exceeded their expectations. At 1.3 million specimens, it is now the tenth largest herbarium in the US. 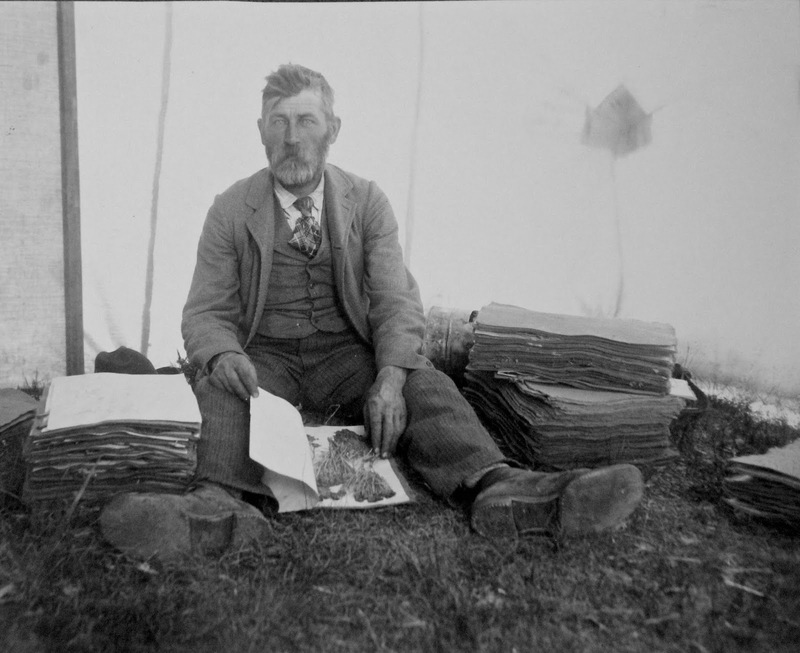 Aven Nelson in the old Rocky Mountain Herbarium. It now occupies the third floor of the Aven Nelson Building, University of Wyoming, Laramie. We call Aven Nelson the Father of Wyoming Botany, a delightful irony given that he became a botanist by bureaucratic error. In his long career, he collected many thousands of specimens (not counting duplicates), described numerous new species, published more than 100 academic articles, and mentored students who became prominent botanists themselves. 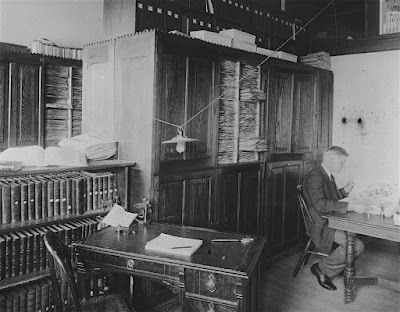 But his greatest legacy is the Rocky Mountain Herbarium, a world-class institution built on a foundation of Yellowstone plants. Culpin, MS. 2003. 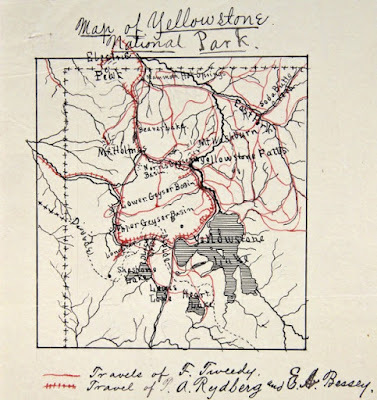 For the benefit and enjoyment of the people: a history of the concession development in Yellowstone National Park, 1872–1966. YCR-CR-2003-01. Yellowstone Center for Resources, Yellowstone National Park, Mammoth, Wyoming, USA. Goodding, L. 1944. The 1899 botanical expedition into Yellowstone Park. University of Wyoming Publications 11:9-12. Goodding, L. 1958. Autobiography of the Desert Mouse. San Pedro Valley News, June 26. Guptill, A.B. 1892-93. All about Yellowstone Park: a practical guide. F.J. Haynes, St. Paul, Minnesota, USA. Nelson, A. c. 1937. The Rocky Mountain Herbarium (typed manuscript). University of Wyoming, American Heritage Center, Aven Nelson Collection, Laramie, Wyoming, USA. Rocky Mountain Herbarium. 2015. Specimen database. University of Wyoming. Rydberg, PA. 1898-1899. Letters to Aven Nelson. University of Wyoming, American Heritage Center, Aven Nelson Collection, Laramie, Wyoming, USA. Rydberg, PA. 1900. 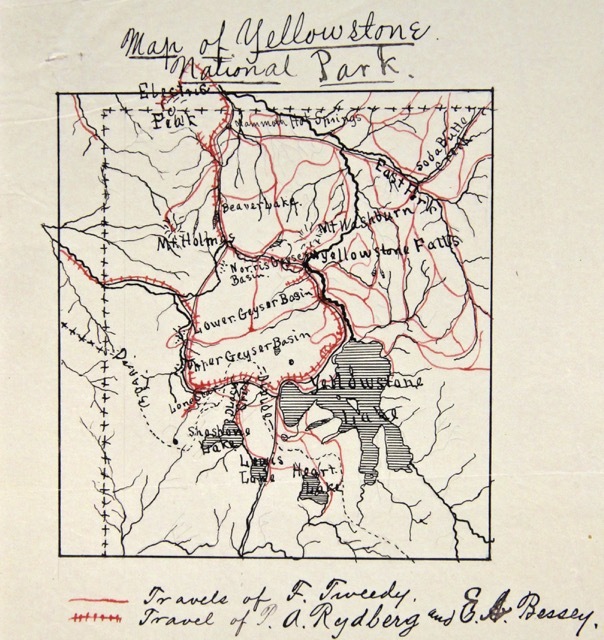 Catalogue of the flora of Montana and the Yellowstone National Park. Memoirs of the New York Botanical Garden 1:1-492. Williams, RL. 1984. Aven Nelson of Wyoming. Colorado Associated University Press, Boulder, Colorado, USA. Williams, RL. 2003. A region of astonishing beauty: the botanical explorations of the Rocky Mountains. Roberts Rinehart Publishers, Lanham, Maryland, USA. Photo by Bonnie Heidel, Wyoming Natural Diversity Database. Author Hollis Marriott has worked as a field botanist in Wyoming and South Dakota for more than 40 years, for federal and state agencies, and private organizations. 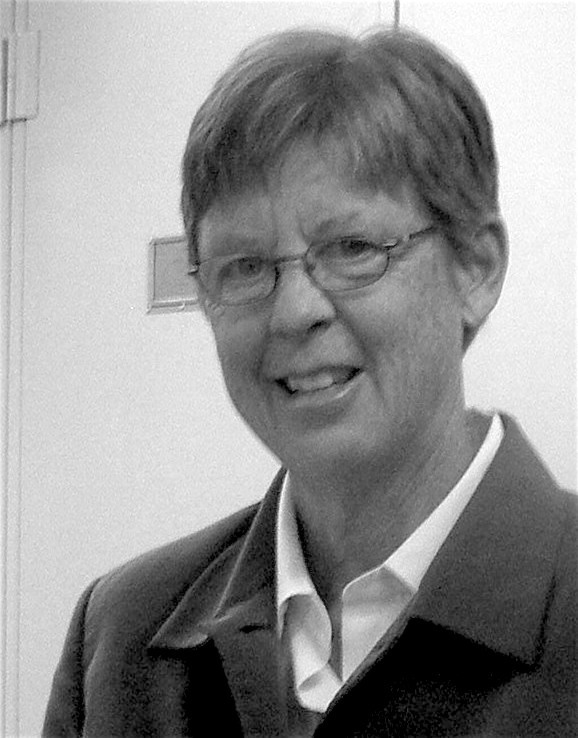 Her specialty is plant and natural area conservation on public lands. She also is a Research Associate with the Rocky Mountain Herbarium at the University of Wyoming, where the spirit of Aven Nelson provides a steady source of inspiration. 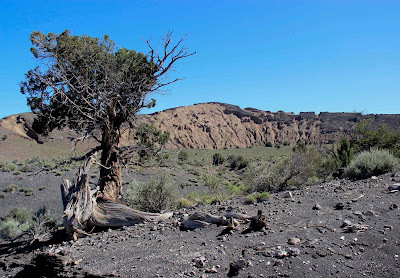 This post is a “finale” in two ways: it’s the final post in a series about the Black Rock Desert volcanic field (1), and it features the final act of a six-million-year performance … maybe. While it’s true that no smoke, tremors or unusual animal behaviors have been reported in recent centuries, the field’s youthfulness, geothermal features and weird rocks all suggest it hasn’t yet played its finale. If that’s the case, what comes next? My field assistant exhibited no unusual behavior (for her). The BRD volcanic field covers almost 2700 sq mi in west-central Utah (2). Eruptions started about six million years ago, but most took place during the last 2.7 million years. Activity was bimodal, ranging from violent eruptions of viscous rhyolite to quietly oozing basalt. BRD subfields of Johnsen et al. 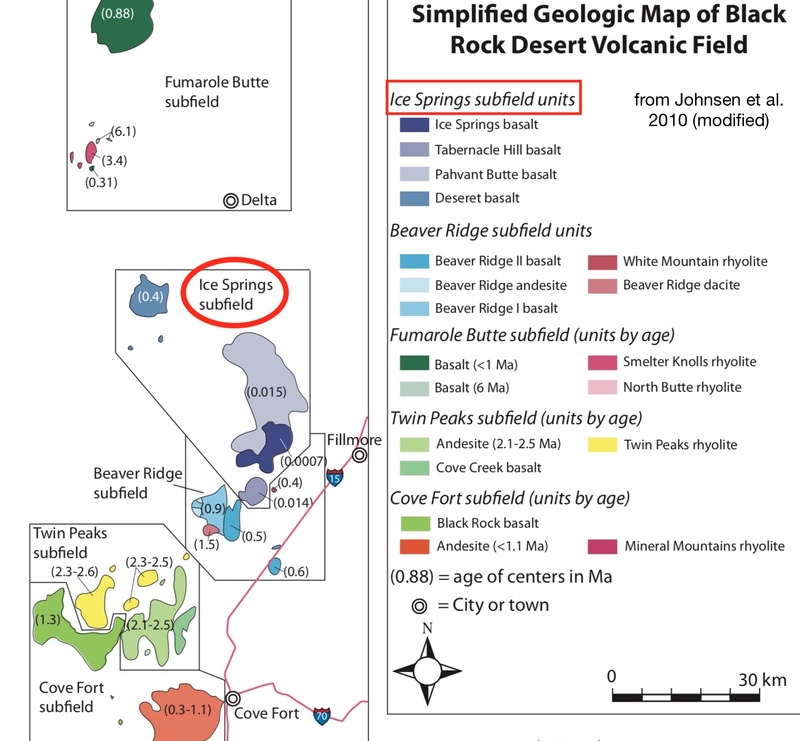 (2010); Ice Springs, the youngest, marked with red. Of the BRD subfields, the Ice Springs is the youngest, with basalt lava flows and cinder cones dating from the last 100,000 years. Three of the most recent eruptions are visible in the photo above, looking north from the lower slope of Tabernacle Hill. On the horizon is 19 Ka (19 thousand years old) Pahvant Butte. 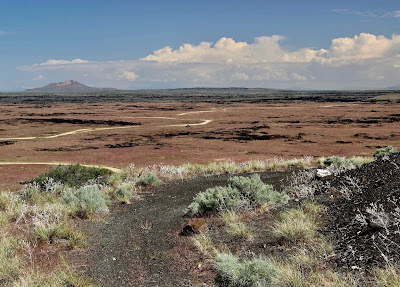 The area traversed by the road (and covered in cheatgrass) is a basalt flow from the ~17 Ka Tabernacle volcano. The darker rocks beyond are the 0.7 Ka Ice Springs flow; just 700 years old, it's said to be the youngest rock in Utah. 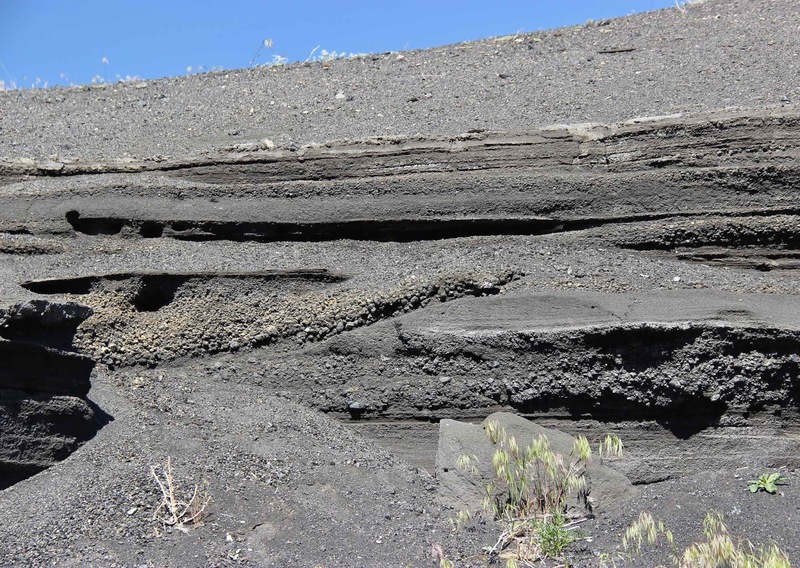 Pahvant volcanic activity spanned about 6000 years, with three episodes (Johnsen et al. 2010). It started with basalt lava flows, now covered in sediment that accumulated on the bottom of Ice Age Lake Bonneville. Thus they must have erupted prior to lake formation 24,500 years ago. 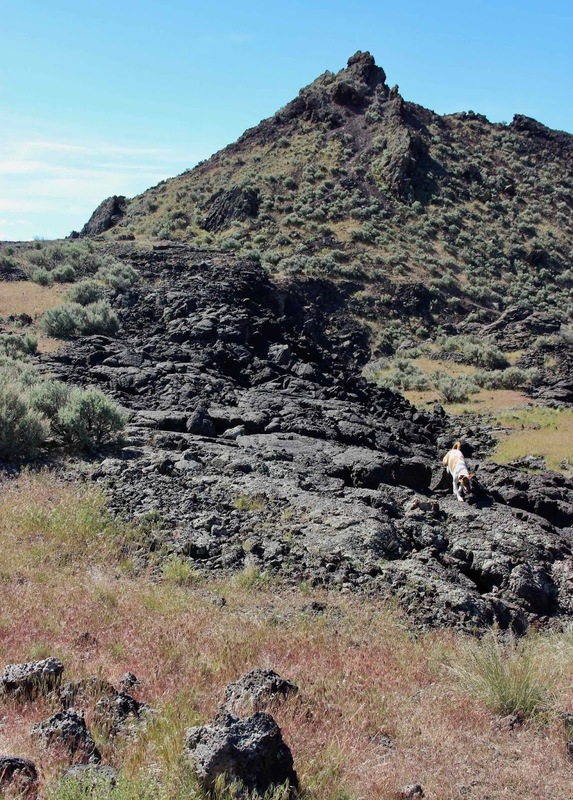 In the second episode, more pre-Bonneville basalt flows partially covered the older ones. Then about 19,000 years ago, things got really interesting. 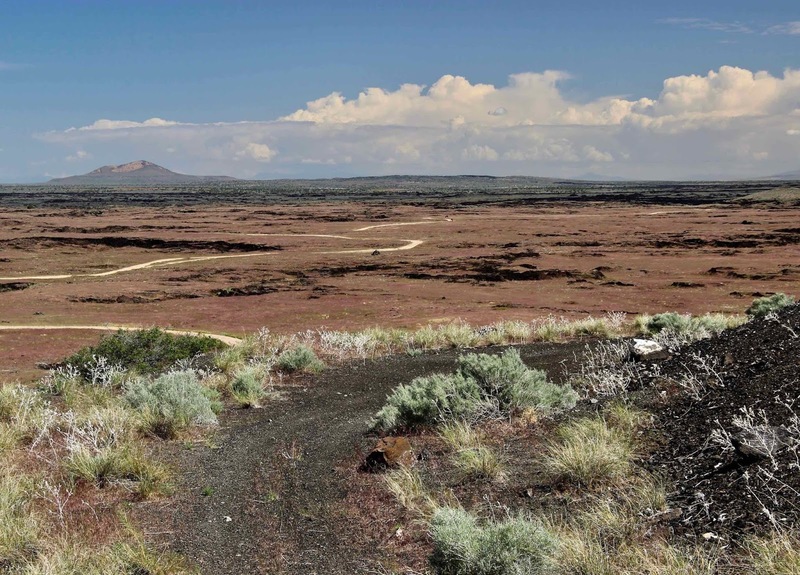 Underwater eruptions marked the birth of Pahvant Butte. 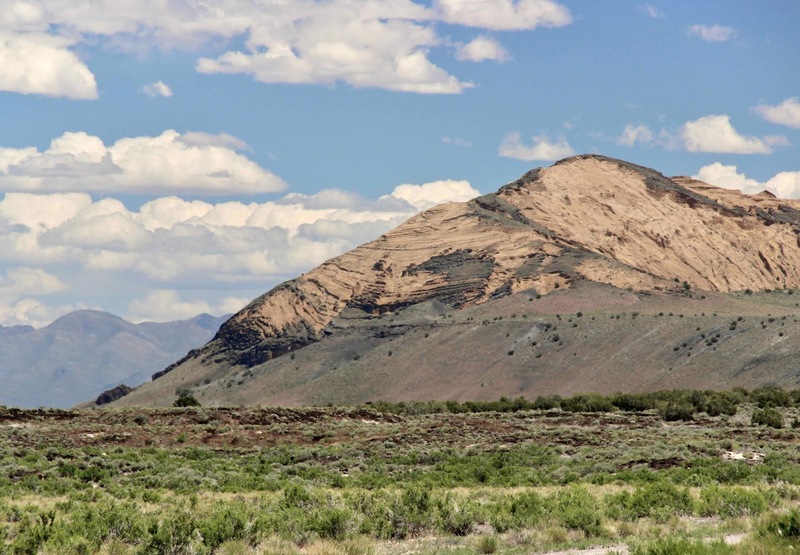 It grew to be a volcanic island in Lake Bonneville, contributing widespread ash to lake sediments. 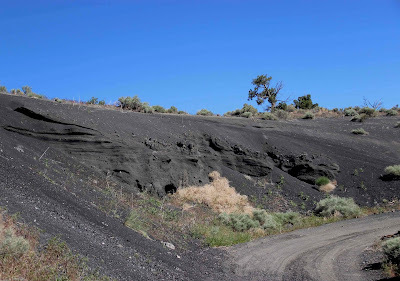 Fault scarp in Pahvant II basalt flow; southeast of Pahvant Butte at the Devils Kitchen. 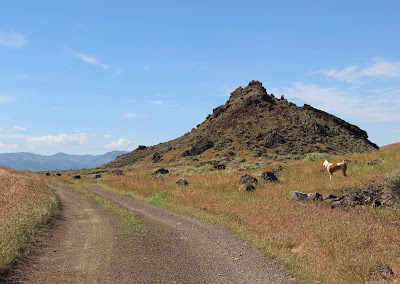 I visited Pahvant Butte last year, but because of a hamstring injury, could only hobble around the base. 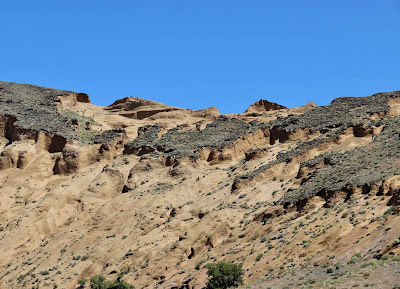 Even so, there was plenty to see, including relic terraces of Lake Bonneville, a “Lace Curtain” of volcanic rock, and puzzling patterns of weathering and erosion on the upper part of the cone. This year, I hiked to the crest to examine the differential weathering. 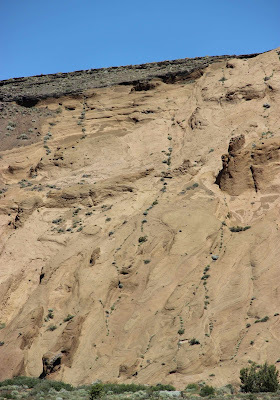 Differential weathering of tuff, above relic Bonneville terrace. Nice stroll up drainage bottom, through volcanic ash and lapilli. View of crater rim from top of terrace. As for the differential weathering—I didn’t reach a firm conclusion. 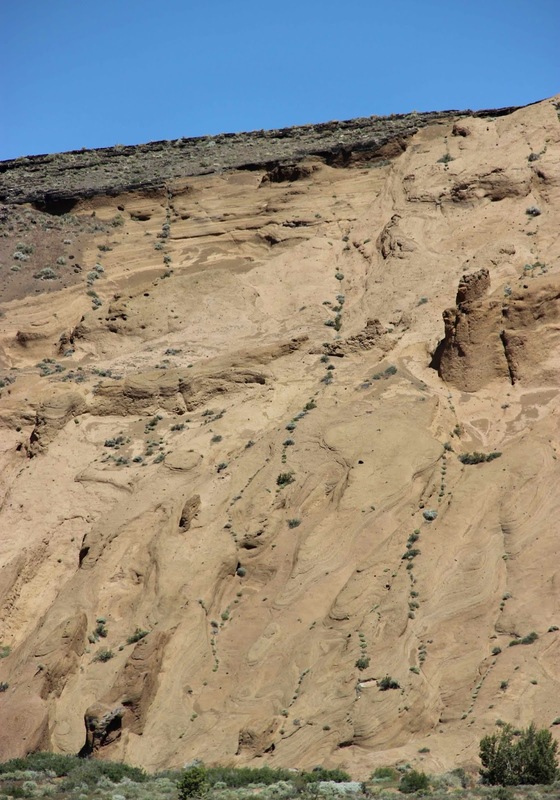 Maybe the tuff simply weathers to form a protective surface, which when broken leads to exposure of fresh tuff and erosion, especially on steeper slopes. The Tabernacle volcano also was active during Lake Bonneville times, but only a bit of evidence of underwater eruption has been found (Johnsen et al. 2010). In its heyday, the Tabernacle area included cinder cones, lava flows, a lava lake and lava tubes that drained the lake. 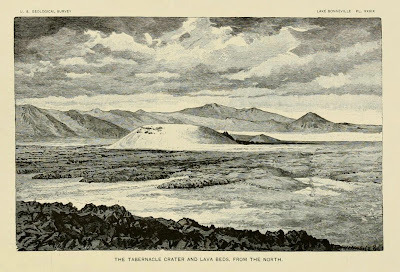 Tabernacle Crater and lava beds from the north (Gilbert 1890). 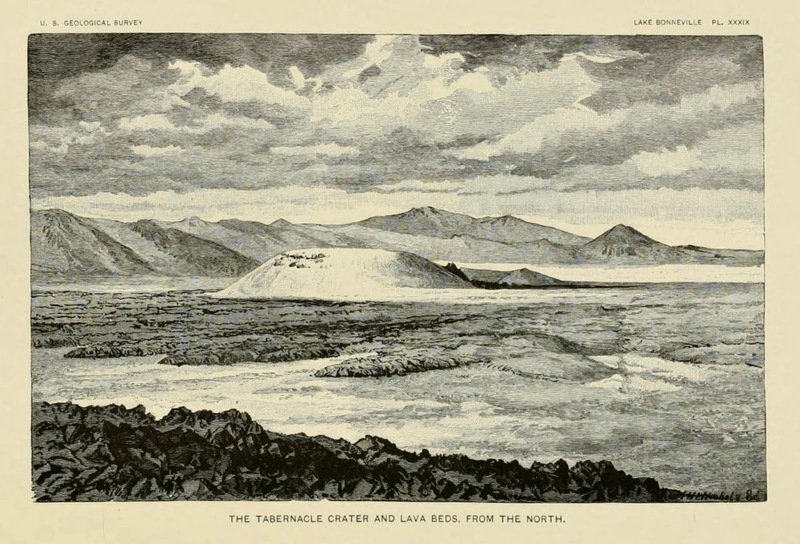 In his study of Lake Bonneville and the Black Rock Desert, Grove Karl Gilbert noted that the Tabernacle Hill's “profile as seen from the Miter crater (PI. XXXIX [above]) resembles the Mormon Tabernacle at Salt Lake City, suggesting an appropriate name”, but I was unable to conjure up a resemblance. 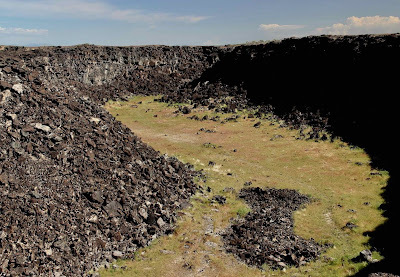 No matter, there were far more interesting things to see: fractured ground, collapsed lava tubes, caves, and sculptures made of contorted basalt. Tabernacle Hill from the northwest. 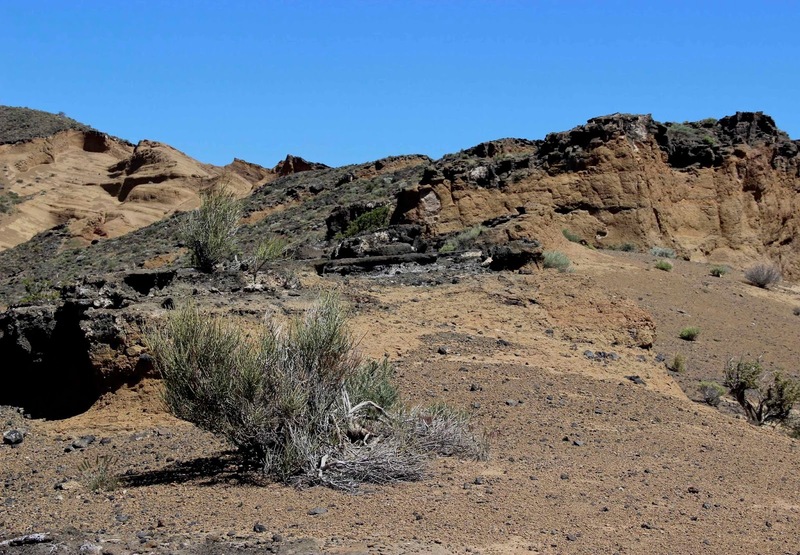 With its lava caves and tubes, the Tabernacle area is one of the better known BRD destinations for the general public. It probably would see more visitation except that access is via a slow rough road (2WD high clearance when dry). Due to signage issues and impatience, I took a wrong turn … but it worked out well. 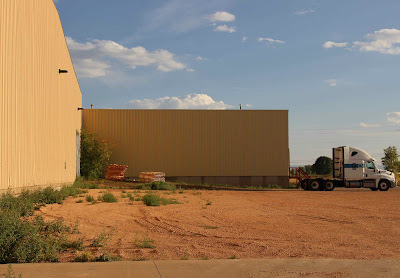 Near the gate of a cinder quarry I met guy who had worked in Evanston, Wyoming (my state), grew up in Kanosh where I was staying, and in spite of being 65 years old, had “only been to the Tabernacle caves once, I’m embarrassed to say”. Thus we had enough material for a good roadside visit—always a pleasure! 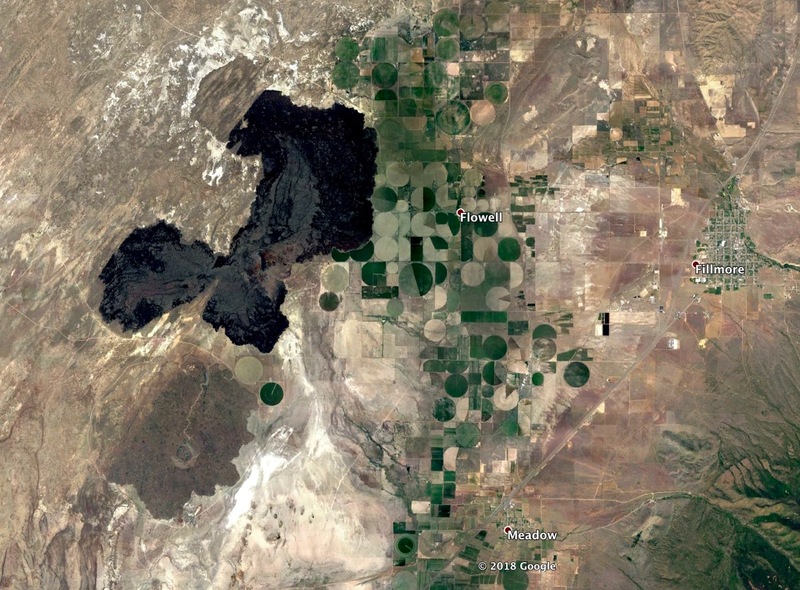 There’s no missing the Ice Springs basalt flow—black tortured rock emerging from irrigated fields west of Fillmore. 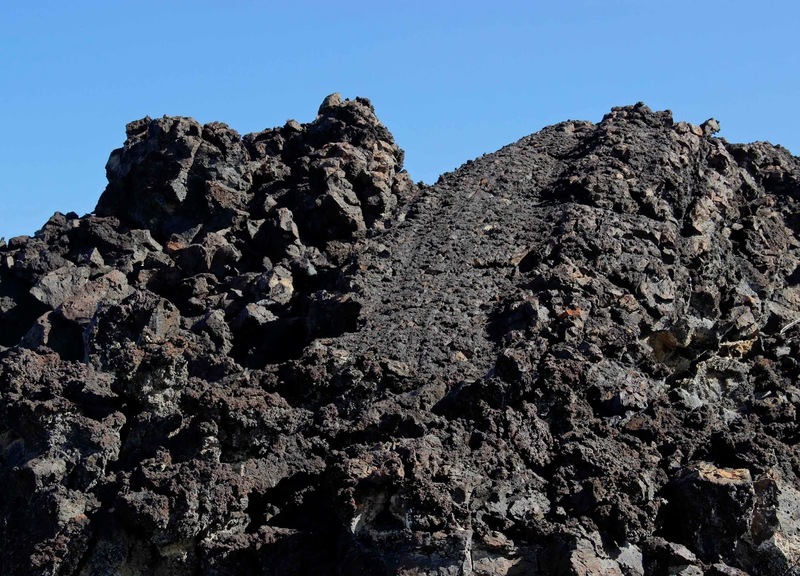 The lava often looks so fresh that it’s hard to believe 700 years have passed since it oozed up from below. The rugged contorted sharp-edged basalt seemed impossible to explore except at the margins. 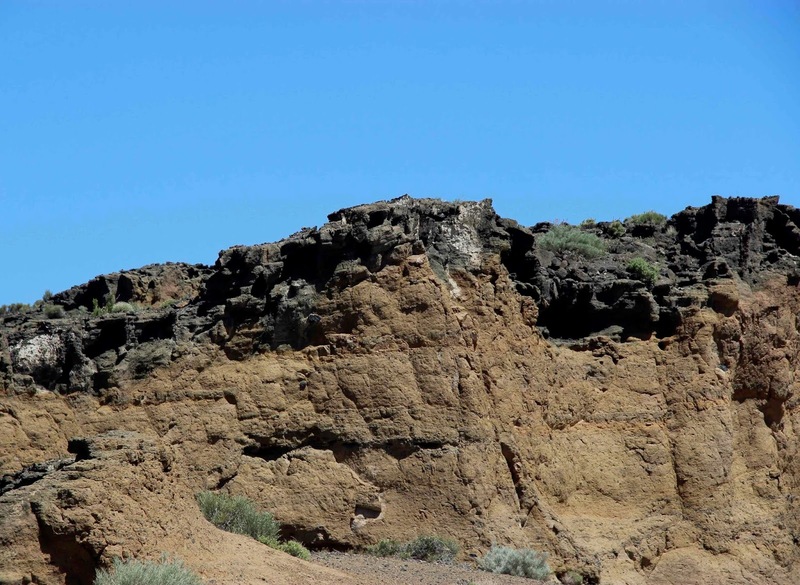 The Black Rock Desert is located at the eastern margin of the Basin and Range Province, but BRD volcanic rocks differ markedly from those of the same age elsewhere in the Province. 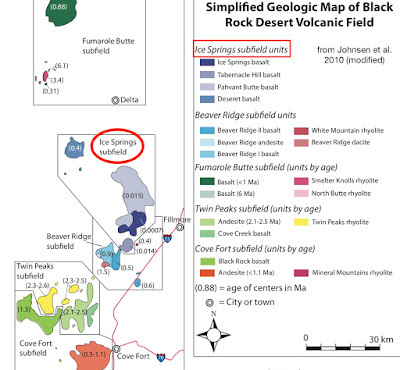 Johnsen and colleagues (2010) refer to this as “one of the [field’s] most puzzling attributes.” In fact, several types of basalt common in the BRD are otherwise rare, except at active plate boundaries. 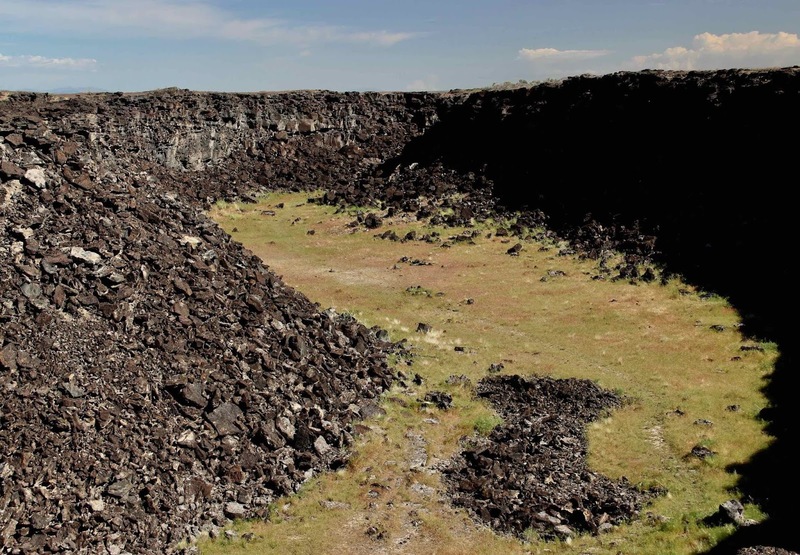 So why are they abundant here, in the interior of the North American Plate? 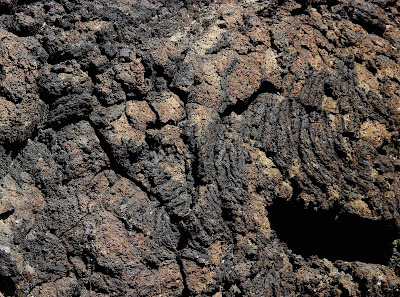 Actually, this is a tectonically-active region. 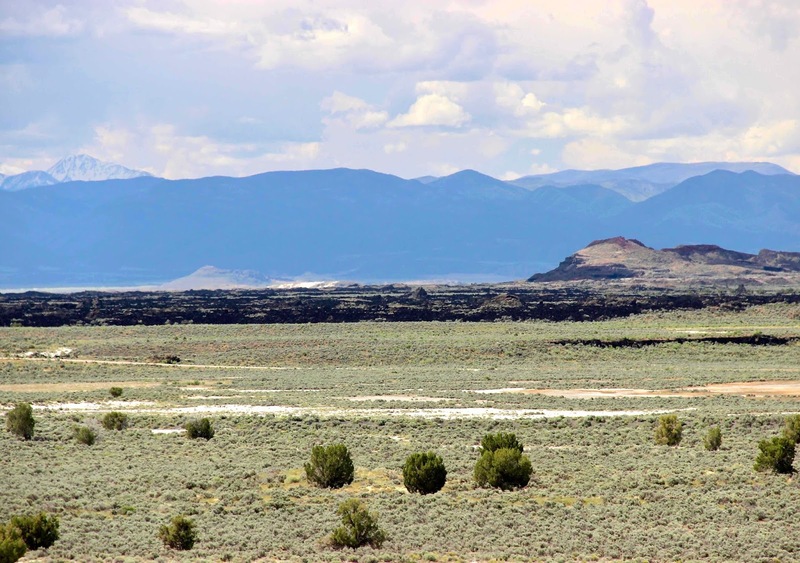 The Basin and Range Province to the west is undergoing extension, and the Colorado Plateau to the east is rotating (see first post in series). Perhaps a new rift is developing (3) … perhaps Black Rock Desert volcanism is an early sign that our continent is being torn asunder, right here in Millard County! But don’t worry … there’s still plenty of time for a visit, and plenty of information to make it interesting (see Sources below). Especially helpful is Millard County's detailed travel brochure about local history, geology, rockhounding and recreation (good maps). 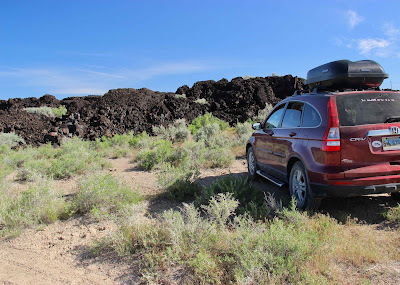 Most sites of interest are on public land, and accessible via gravel and dirt roads passable with 2WD vehicles, at least when dry. Usage was pleasantly light when I was there. 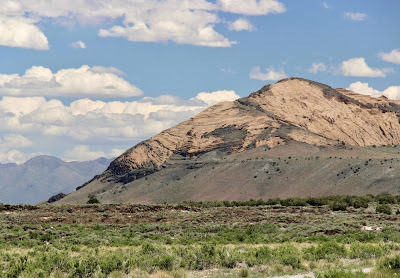 (1) Previous posts in this series: Volcanoes in Utah—how can that be? 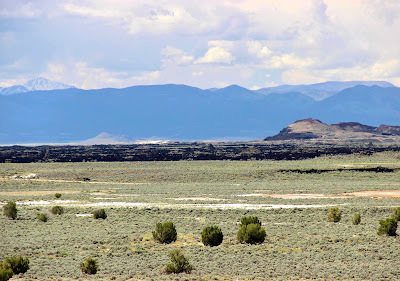 !, Sunstones at Sunstone Knoll, A Caldera Lake?, and White Mountain in the Black Rock Desert. 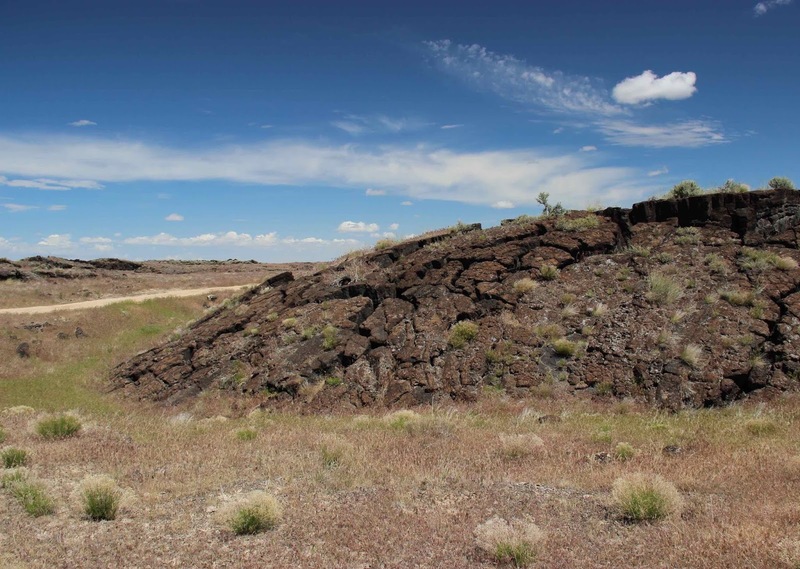 (2) The perimeter of the BRD volcanic field encompasses about 2700 sq mi; the extent of volcanic deposits is unknown as all but the youngest are buried under Lake Bonneville sediments. 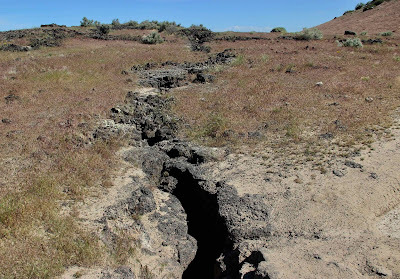 (3) This possible rift along the western margin of the Colorado Plateau would be in addition to Basin and Range extension to the west—also considered a developing rift (see DeCourten 2003, final chapter). A rift has already developed along the eastern margin of the Plateau—the Rio Grande Rift. DeCourten, FL. 2003. The Broken Land: adventures in Great Basin geology. Salt Lake City, Utah: University of Utah Press. Gilbert, GK. 1890. Lake Bonneville. USGS Monograph 1. Washington DC:GPO. Available online. 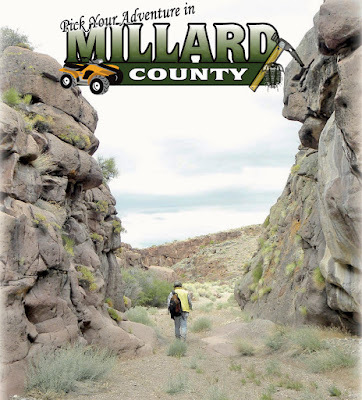 Millard County Travel. c. 2016. Adventures in Millard County Utah. Available online (PDF) and locally at museums, agency offices, etc. 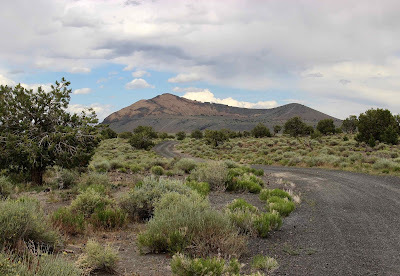 Utah Geological Survey Geosights: Volcanic Sights in the Black Rock Desert, Pahvant Butte and more. Volcano Hotspot. 2018-01-09. Recent volcanic activity in SW Utah. 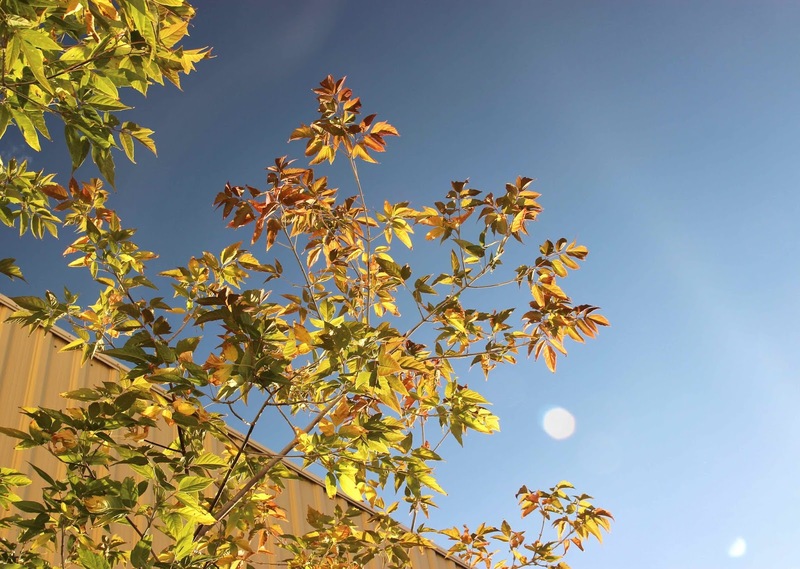 Though our weather continues to be abnormally mild, most deciduous trees show signs of the approaching autumn, with various degrees of color change in their leaves. But the boxelder I’m following seems to be of two minds as to whether to the growing season is ending (1). 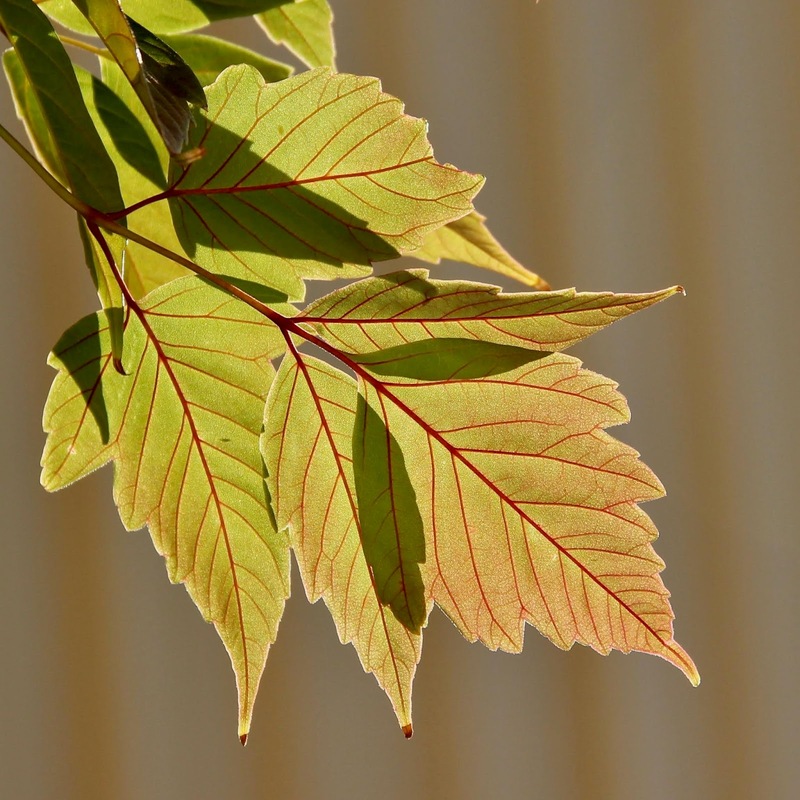 Should it stop making green chlorophyll, revealing previously hidden red and yellow pigments? Should it quit nourishing its leaves altogether, ensuring senescence, abscission and loss? Or should it just keep on growing? 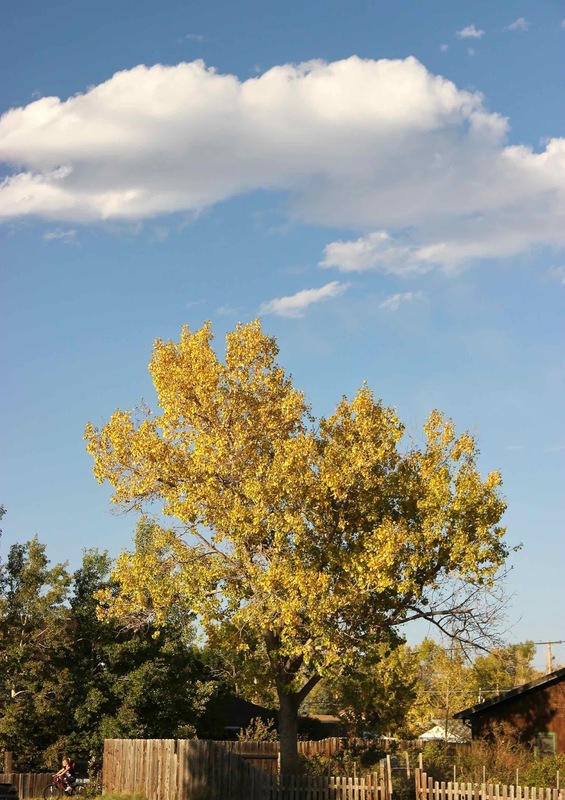 Plains Cottonwood in my yard. Leaves are a bit sparse this year due to our hot dry summer. Young cottonwoods along road to Laramie River. Yesterday evening, after the workday was over and everyone had gone home, I walked to the west side of the warehouse to find out what the boxelder was up to. 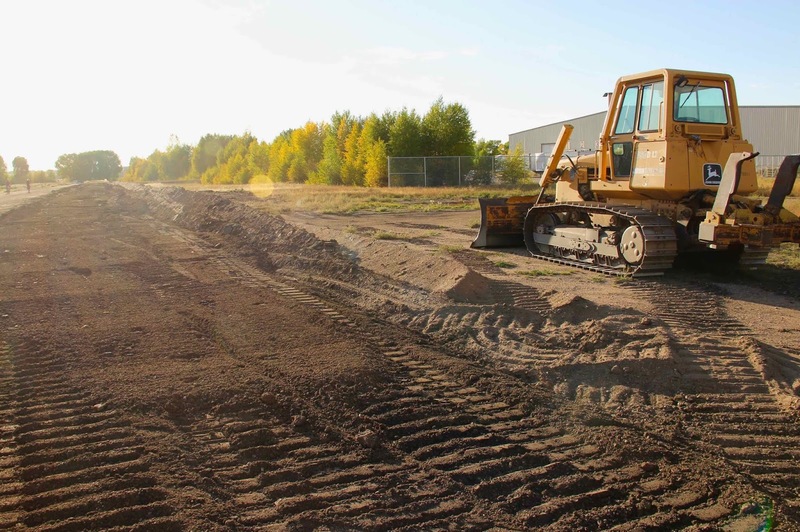 As you can see in the photo above, changes are underway—a strip of grassland next to the dirt road has been removed. When I discovered this last week, I was worried; I walk this way to the Laramie River almost everyday. Then one morning I chatted with the bulldozer operator and got some good news. The dirt road we’ve used all these years is on private property, but the Wyoming Department of Transportation secured a right-of-way and is making a new public dirt road to the river (2). WYDOT rocks!! 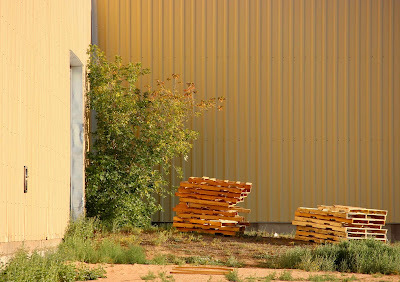 As usual, I caught my first view of the boxelder after rounding the corner of the warehouse. Though it was still mostly green, I could see, even at a distance, that a few branches had changed. Up close, these were beautiful arrangements of green and red leaves glowing in the golden evening light. Stacks of pallets are new additions since last month. But as was obvious from a distance, most of the leaves were still summery green. 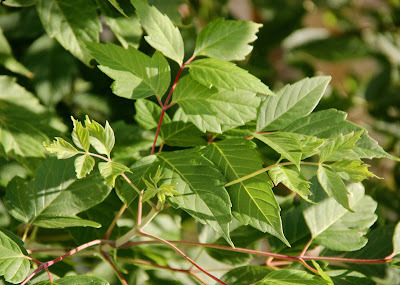 In fact I saw several branchlets with young leaves. Apparently the boxelder is hedging its bets—maybe not too surprising for a pioneering adaptable “weedy” species. 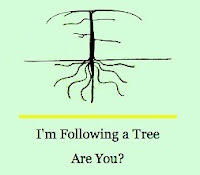 Once again tree-followers are meeting for a monthly virtual gathering, reporting the latest news for the trees we are following this year. If you want to give it a try, come join us! See the blog of our gracious host, The Squirrelbasket, for more information. (1) UK readers: Several dictionaries informed me that you would find our (USA) phrase "of two minds" strange, preferring "in two minds" ... correct? (2) This right-of-way and dirt road are part of the new road/bridge project that I mentioned in several tree-following posts. The project is almost done. Road, bridge and bikepath are fully functional; just a few minor things need finishing.